Here you will find full boxes of disposable foam ear plugs. While we make it easy to buy just a few pairs of any of these plugs, many of our customers prefer to buy ear plugs by the box. Each box contains a good quantity of foam ear plugs (the exact number of pairs per box varies), and buying by the box provides a great discount as compared to buying pairs in single or odd quantities. 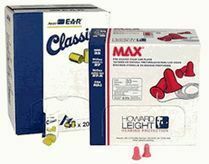 If you have found the perfect foam ear plugs for your personal use, buying a box is the perfect way to stock up and save. For small businesses, boxes of foam ear plugs may present an ideal solution: the right amount of ear plugs at good prices. Please note that larger companies and organizations may find better results shopping for cases of foam ear plugs. (NRR 32) Elvex Blue™ UF foam ear plugs feature a slow expansion, low pressure, polyurethane foam that helps users get a proper deep-in-the canal fit, and provides for all day comfort. Box of 200 Pairs.